You can modify the user profiles at any time to update the user information. You can only change other user profiles. If you log in using your personalized login name, you will not be able to modify your own user profile. 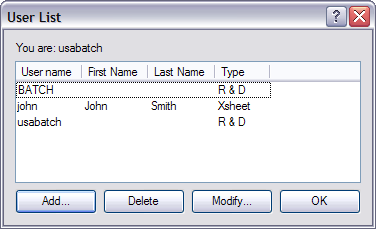 To change your own user profile, login as usabatch (the default user). 2. Select the profile to modify. The Modify User dialog box appears. If you modify the user name, make sure that it does not exceed the 12-character limit. 5. Click on the OK button to complete the update or click Cancel to abort it.